Try your hand at our No-Oven Peanut Butter Squares after watching this helpful video. 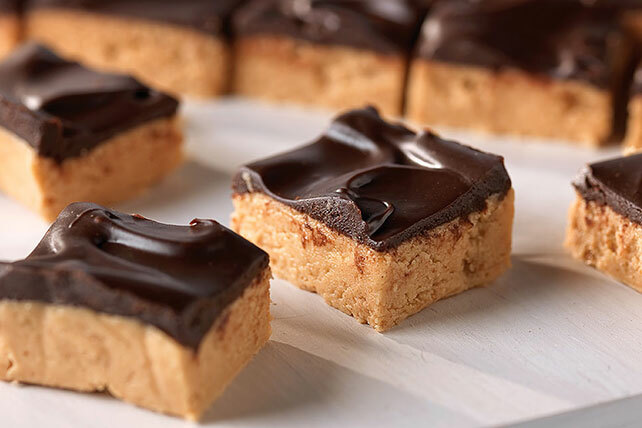 See why these easy-to-make creamy peanut butter squares are so tasty! Line 13x9-inch pan with Reynolds Wrap® Aluminum Foil, with ends of foil extending over sides. Microwave butter in large microwaveable bowl on HIGH 45 sec. or until melted. Add sugar, graham crumbs and peanut butter; mix well. Spread onto bottom of prepared pan; cover with chocolate. Make shallow cuts in top of dessert to mark 48 squares. Refrigerate 1 hour or until firm. Use foil handles to remove dessert from pan; cut into squares following scored lines on dessert. Prepare recipe as directed, using a 9-inch square pan and reducing the chocolate to 2 pkg. Cut into bars instead of squares. Microwave BAKER'S Chocolate to be used in microwaveable bowl on HIGH 30 sec. ; stir. Microwave 30 sec. more; stir. Continue heating and stirring in 10-sec. increments until chocolate is completely melted.